The Milton Ensemble is a collection of artists dedicated to presenting the books of John Milton’s epic poem Paradise Lost as a dramatic reading. Through our unique interpretation, we remain faithful to every word of the poem, but through use of individual and choral voices plus music we bring the full power of the oral tradition into play and provide the audience with a much easier way to understand the poem. In particular, by permitting an audience member to utilize his or her ear as well as the division of the narrative voice into three separate characters: the Storyteller, the Arguer, and the Classical Allusionist or Miltonic voice, a listener more easily follows the intricacies of Milton’s syntax and his intentions. 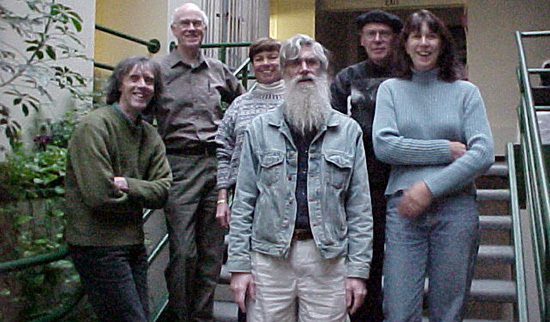 The Ensemble has performed books at venues all over central New England, from the Northeast Modern Language Association Conference in Hartford, Connecticut, an early 18th century church in Sturbridge, colleges in Worcester, Massachusetts; and Keene State College, in New Hampshire. Additionally, in conjunction with The New Hampshire Humanities Council, the New England Foundation for the Arts and the New Hampshire State Council on the Arts they have created performance scripts for all twelve books fo the epic poem, along with DVDs and CDs to illustrate the process. The ensemble is directed by Rodger Martin, a New Hampshire State Council on the Arts Touring Poet, and Eugene McCarthy, Professor Emeritus of Seventeenth Century Literature at Holy Cross. Music is composed and played by jazz musician Michael Wakefield.